Water is a well-known solvent for the dissolution of most of the compounds we know. But all compounds in nature do not mix with water. The substances that can mix with water are called hydrophilic substances; the substances that cannot mix with water are known hydrophobic substances. This happens mainly due to the polarity of water molecules. Nonpolar compounds cannot dissolve in a polar solvent. Here, we should consider the fact “like dissolves like”. Polar compounds can dissolve in polar solvents. Nonpolar compounds dissolve in nonpolar solvents. Therefore, hydrophilic substances should be polar in order to dissolve in water. The main difference between hydrophobic and hydrophilic molecules is that hydrophobic molecules are nonpolar whereas hydrophilic molecules are polar. Hydrophobic molecules are molecules that do not dissolve in water. Therefore, these molecules repel water molecules. These hydrophobic molecules are called hydrophobes. The hydrophobicity describes how much hydrophobic a molecule is. Hydrophobic molecules are hydrophobic due to their non-polarity; in other words, hydrophobic molecules are nonpolar. Therefore, hydrophobic molecules are often composed of long chain hydrocarbon groups which can make a molecule nonpolar. When hydrophobic molecules are added to water, these molecules tend to form micelles, which look like clumps, in order to have a minimal contact with water. However, water molecule arranges around these clumps to form a cage. When this clump is forming, the hydrogen bonds between water molecules are broken down, making space for the clump. This is an endothermic reaction since chemical bonds are broken down. Moreover, the formation of clumps causes the entropy of the system to decrease. ΔS is the change in entropy. When hydrophobic molecules are added to water, ΔS decreases. Therefore, the value of TΔS is decreased. Since it is an endothermic reaction, the ΔH is a positive value. Therefore, the value of ΔG should be a large positive value. A positive ΔG value indicates that the reaction is not spontaneous. Hence, the dissolving of hydrophobic molecules in water is non-spontaneous. Interactions that occur between hydrophobic molecules are Van Der Waal interactions since they are nonpolar molecules. These interactions are given a specific name: hydrophobic interactions. The clumps present in water tend to interact and mix with each other in order to further minimize the contact with water. The change in enthalpy for this reaction is a positive value since the hydrogen bonds between water molecules that surround the clumps are broken down. The entropy of the system is increased since the cages that the clumps were in are broken down to free up hydrophobes. When the overall process is considered, the ΔG value gets a negative value. Therefore, the formation of the hydrophobic bonds is spontaneous. Hydrophilic molecules are molecules that can dissolve in water. That is, the hydrophilic molecules attract water molecules. The hydrophilic character of a molecule can be described as its hydrophilicity. Hydrophilic molecules are polar molecules. Water molecules are polar molecules, which allows polar molecules to get dissolved in water. These hydrophilic molecules are called hydrophiles. 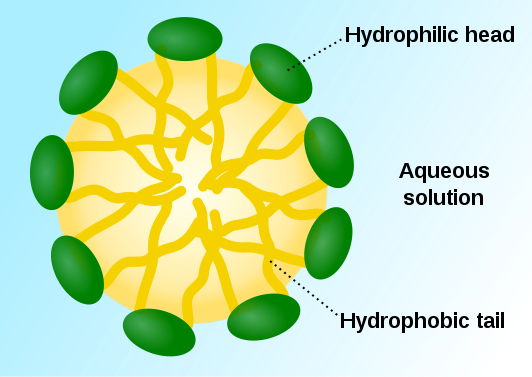 Figure 1: Formation of micelles. Here, the hydrophilic part is directed to the outside because hydrophilic part attracts water. The entropy of the system is increased due to the mixing of hydrophilic molecules with water and then the change in entropy ΔS is a positive value. Since new bonds are formed between hydrophiles and water molecules, this mixing is exothermic. Then the change in enthalpy is a negative value. Hence, the Gibbs free energy is a negative value indicating that the mixing is spontaneous. The hydrophilicity of the hydrophiles decides how well these molecules are going to be dissolved in water. The polarity of molecules arises due to the differences between electronegativity values of the atoms in chemical bonds. Higher the difference, higher the polarity; then, higher the hydrophilicity. Hydrophobic Molecules: Hydrophobic molecules are molecules that do not dissolve in water. Hydrophilic Molecules: Hydrophilic Molecules are molecules that can dissolve in water. 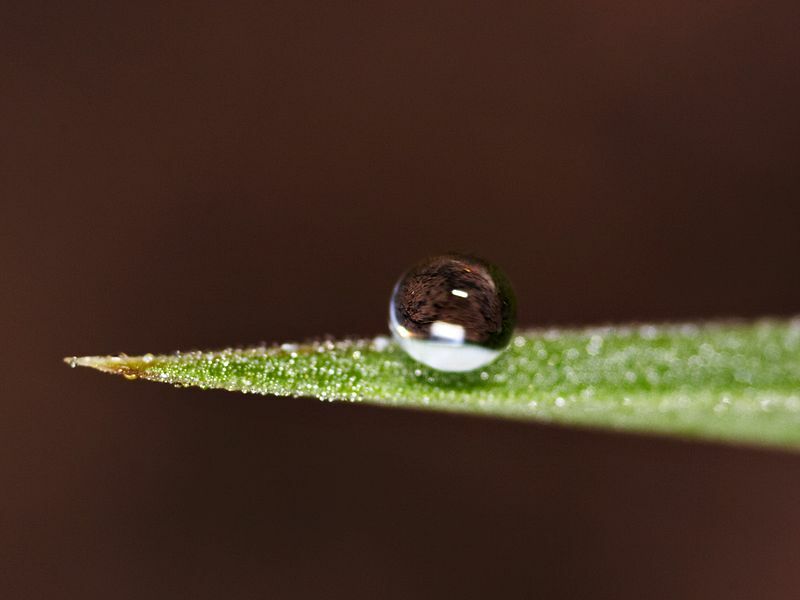 Hydrophobic Molecules: Hydrophobic molecules are called hydrophobes. Hydrophilic Molecules: Hydrophilic molecules are called hydrophiles. Hydrophobic Molecules: Hydrophobic molecules repel water molecules. Hydrophilic Molecules: Hydrophilic molecules attract water molecules. Hydrophobic Molecules: Hydrophobic molecules are nonpolar. Hydrophilic Molecules: Hydrophilic molecules are polar. Hydrophobic Molecules: When hydrophobic molecules are added to water, the Gibbs free energy gets a positive value. 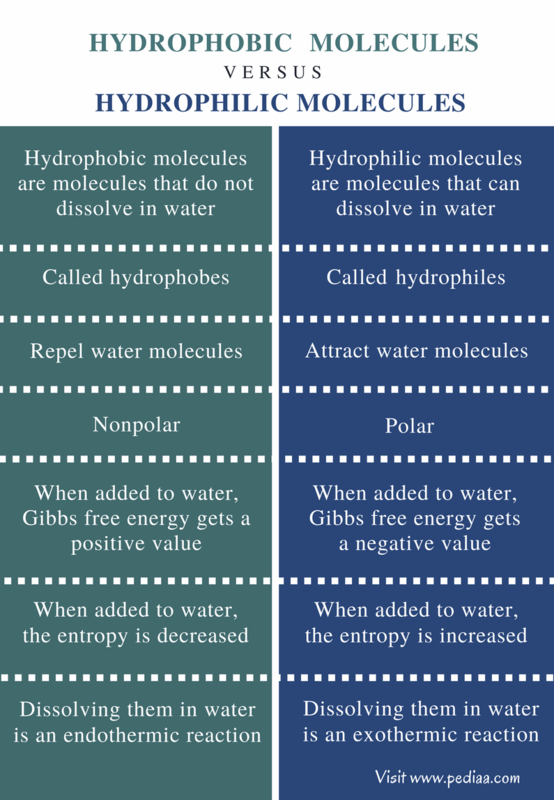 Hydrophilic Molecules: When hydrophilic molecules are added to water, the Gibbs free energy gets a negative value. Hydrophobic Molecules: When hydrophobic molecules are added to water, the entropy is decreased. Hydrophilic Molecules: When hydrophilic molecules are added to water, the entropy is increased. Hydrophobic Molecules: Dissolving hydrophobic molecules in water is an endothermic reaction. Hydrophilic Molecules: Dissolving hydrophilic molecules in water is an exothermic reaction. Molecules can be categorized as hydrophobic molecules or hydrophilic molecules according to the response these molecules show to water molecules. Hydrophobic molecules repel water molecules. Hydrophilic molecules attract water molecules. However, the key difference between hydrophobic and hydrophilic molecules is that hydrophobic molecules are nonpolar whereas hydrophilic molecules are polar. 1. “Hydrophilic: Definition & Interaction.” Study.com, Available here. Accessed 20 Sept. 2017. 2.“Hydrophobic Interactions.” Chemistry LibreTexts, Libretexts, 14 May 2017, Available here. Accessed 20 Sept. 2017.